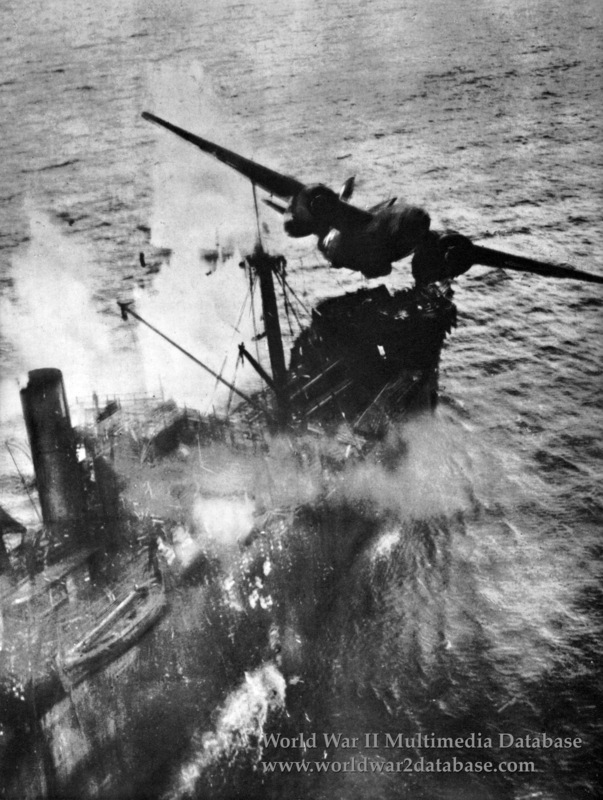 Douglas A-20G-30-DO Havoc "Tobias the Terrible" serial number 43-9477 of the 89th Bomb Squadron, 3rd Bomb Group, 5th Air Force, pulls out after skip bombing Taiei Maru off Wewak. Pilot Lieutenant John Soloc's engine was shot out as he came around to attack; losing power, he elected to continue the attack. As he delivered his bomb amidships, his wingtip and propeller struck the ship's mast. The hydraulics were shot out and the bomb bay doors could not be closed. Unable to gain altitude or speed, the A-20 crashed a few miles away. Soloc survived; his gunner, John L. Bradley, went down with the plane. After seventeen hours in the water, he was spotted by Lieutenant John P. "Jock" Henebry of the 90th Bomb Squadron. A US Navy Consolidated PBY-5 Catalina flying boat picked him up. Soloc was given a week's leave and returned to combat; he flew 61 missions by the end of the war. Taiei Maru, a 3,221 ton freighter operated by the Kuribayashi Shosen Kisen Kaisha (Kuribayashi Competitive Steamship Lines) was part of Wewak convoy Number 21 with Yakumo Maru and auxiliary subchasers Cha-47 and Cha-49. Two Consolidated B-24 Liberators of the 63rd Bomb Squadron, 43rd Bomb Group, 5th Air Force sank Yakumo Maru at 0230 Hours by radar; after sunrise nine A-20Gs of the 89th, with over 70 other Allied aircraft, attacked the convoy. An intercepted message from Imperial Japanese Army General Headquarters on March 28 reported all four ships sunk and notified 8th Area Army on Wewak that their supply convoys were suspended indefinitely because of Allied aerial supremacy. Wewak fell to the Australians on May 10, 1945.